1.3" x 0.8" x 0.5"
This natural color dark green tourmaline crystal section is lightly included with fine cabochon grade transparency. It actually has some facet grade areas, and it would yield 15 carats of fine cabochon gemstones. 1" x 1" x 0.8"
This natural color dark green tourmaline crystal section has areas that are translucent to semi-transparent when held up to a light. 1.3" x 1" x 0.7"
This natural color dark green tourmaline crystal section has translucent to semi-transparent areas when held up to a light. 1.1" x 0.9" x 0.9"
1.2" x 0.8" x 0.6"
This natural color dark green tourmaline crystal section is lightly included with fine cabochon grade transparency and some facet grade areas. It would yield over 15 carats of fine cabochon gemstones. 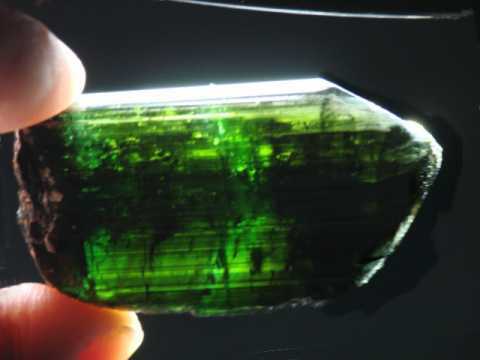 this genuine green tourmaline crystal is 1.4" x 1.1" x 0.9"
This natural tourmaline crystal appears black, however it has very dark green natural color as shown when held up to a light. It has natural terminations with excellent luster in good condition, and it is semi-transparent to transparent. See also another view, as well as a side-view photo. this genuine green tourmaline crystal is 2.1" long x 1.1" x 0.8"
This natural tourmaline crystal has dark green natural color as shown when held up to a light. It has natural terminations in mostly good condition with some abrasions, and it is semi-transparent with a large internal area of cabochon grade transparency. See also another view. 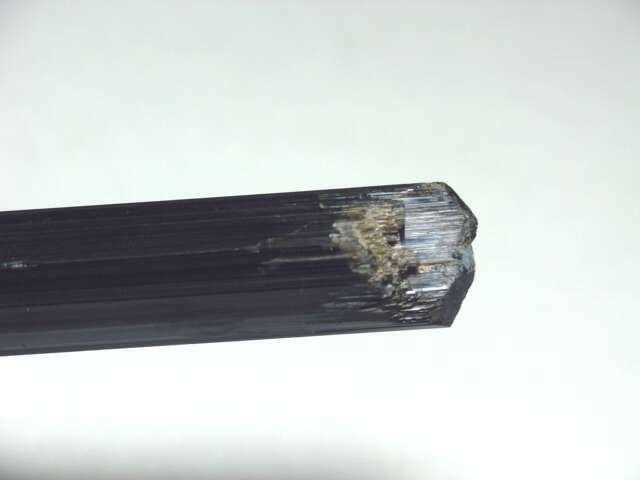 2.9" long x 0.3" x 0.3"
This rare quality tourmaline crystal appears to be black, but when held up to a light it is actually a very dark green color at one end that grades into dark brown in the middle and then into black toward the tip. It is naturally terminated, and it has flawless gem-grade transparency when illuminated. 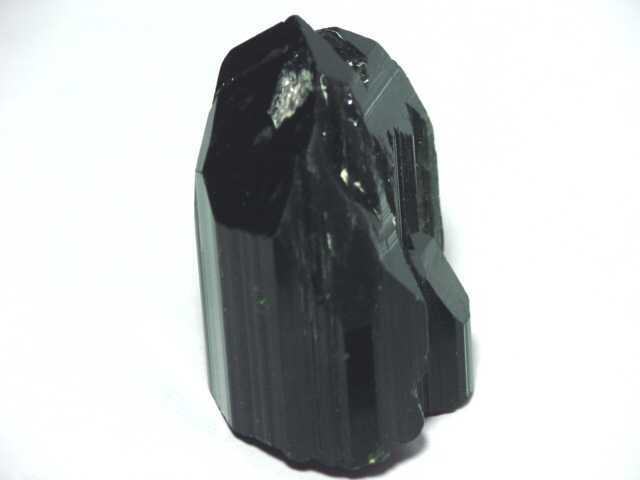 The prismatic faces and the terminations of this dark green tourmaline crystal are in very good condition. 6.4" long x 0.65" x 0.65"
This rare quality tourmaline crystal measures 6.4 inches long. It appears to be black, but when held up to a light it is actually a very dark green color at one end that grades into dark brown toward the middle and then into black toward the tip. It is naturally terminated, and it has flawless facet grade transparency when illuminated. The prismatic faces and the terminations are in good overall condition. See also a close-up photo of the tip. This is the end of our Green Tourmaline Lapidary Rough virtual gallery page. Many of our green tourmaline crystals have cabochon grade areas, so be sure to also see these natural color green tourmaline crystals and matrix mineral specimens. Would you like us to inform you when we add more transparent natural green tourmaline lapidary rough on this page? 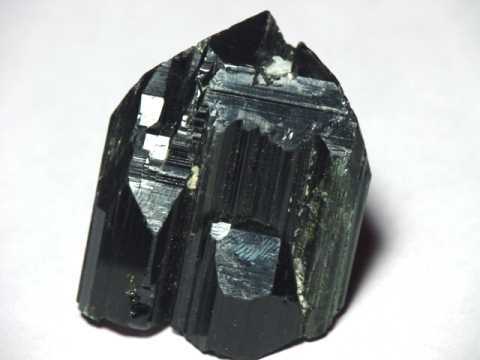 We have over a very large inventory of natural green tourmaline items in stock, so be sure to let us know if you have any natural green tourmaline special requests. Please contact our webmaster or our 'site' geologist with any questions or comments.